You are here: Home / Blog / Archives / Bizzaro! OK MAgS students, pop quiz — who can shed some light on this for Wendy? * The lack of nominative case when using pronouns; Bizarro replaces pronouns that should be nominative with their analogues in the accusative case. 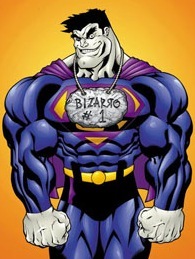 Bizarro might introduce himself by saying “Me am Bizarro” instead of “I am Bizarro,” for example. 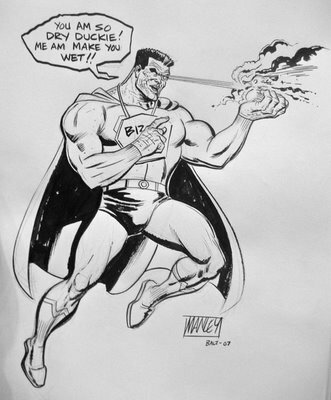 * The lack of proper verb conjugation; Bizarro only uses the first person conjugation for any verb. For example, the verb “is” is always conjugated as “am”, leading to sentences like “This am great”. * Speaking the opposite of what is really meant in a situation. Thus, “This am great” would mean that the thing isn’t great at all. The exception would be “Me am Bizarro”, which would actually mean what was said. Bizarro-English words are thus antonyms of the corresponding English words. Ah! There is something here . . .
Perhaps Bizzaro is the traditional, medical model nursing home and the duckie represents an Elder residing in one?